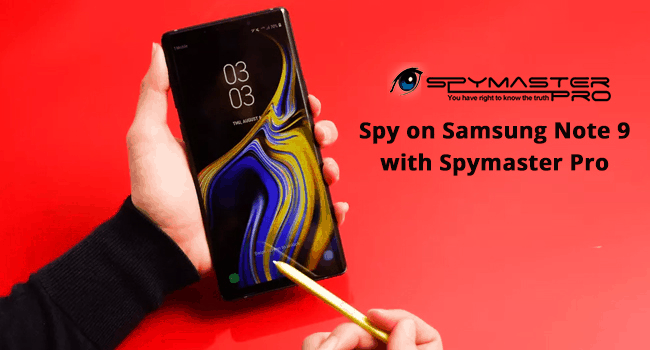 Spy on Samsung Galaxy Note 9 with Spymaster Pro! Wondering how to spy on Samsung Note 9? Congratulations for landing on the right page! We live in a world where, already, the adoption of new technology happens in a whirlwind-where gratification derived from one technological is short-lived. We always look forward to new innovations. So, here we are going to shed light on the new release of Samsung Note 9 and a foolproof way to spy on Samsung Note 9. Recently, Samsung has launched its futuristic Smartphone called Samsung Note 9. The release of Note 9 has bought another meaning to the term Smartphone and that too with a beautiful and elegant design. It is definitely going to drop bombs on its competitors. Design: The Note 9 comes with 6.4 (16.24 cm) display with 1440*2960 Pixels. Operating System and chipset: The handset runs on Android 8.1(Oreo), Powered by Qualcomm Snapdragon 845 SoC Processor. Spymaster Pro, a mobile monitoring app that let you spy on any Android or iPhone. It is completely safe to use and designed to work in hidden mode so that the user under the surveillance won’t know that he/she is under observation. This intelligent application is best for stealth spying. It transfers all the mobile phone activities of the target user’s cell phone without showing any icon on the mobile phone. This application can help you know the target user’s whereabouts, phone call details, Social media conversation, and much more. We usually read in newspapers or listen to the nightly news that how the Smartphones are turning a bane for human mankind. But now, there is no need to worry because you got your hands on the world’s most trusted mobile monitoring app. Buy Spymaster Pro today to monitor your loved ones and safeguard them from any danger.